Hangman Pro is a modern take on the classic hangman word guessing game. It features colorful, non-violent graphics, digitized sounds, dozens of built-in word categories, unlimited lists of your own words, hints, timed games, photo fun, and much more. Hangman Pro is educational too. It's played for fun, but you can't help learning. A special Knowledge Area includes information associated with the guessed word or phrase. If the word chosen is from the States or Countries category, for example, the Knowledge Area will show the capital of the State or Country. If the category is Authors or Composers, the knowledge area will show facts about, or famous works of, the author or composer. You can even make your own lists (unlimited in number) and include your own associated information. There are 70+ categories, guaranteed to include something for everyone. Hangman Pro also offers full support for what's often known as accented characters. Hangman Pro supports the entry and display of words in many languages, including Danish, Dutch, English, Finnish, Flemish, French, German, Italian, Norwegian, Spanish and Swedish. Hangman Pro makes learning vocabulary more fun than ever before. 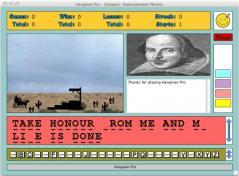 The new Hangman Pro is a Universal Binary Macintosh application. It runs natively on older PowerPC and newer Intel-based Macintoshes. Rosetta is NOT required.